Heavy duty, style, and innovation. By Paramount Restyling, these were the key phrases we had in mind when working on this line of bumpers, and the resulting products definitely embody these ideas. Made with 3/16" durable mild steel plating, 2"x0.120" tubes, and a top quality two-stage powder coating process using epoxy pre-coating and high-grade textured black powder coating, these bumpers are made to withstand anything that gets in their way! Optional LED lights are installed to provide extra looks and functionality. 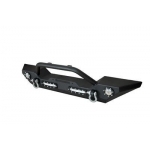 The bumpers' angular design allows for high clearance while simultaneously providing your Jeep with the sharp-looking reinforcement you want! 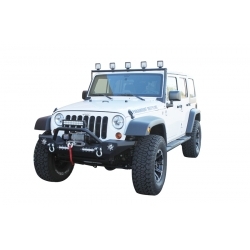 Front and rear bumpers come with D-Ring mounts welded on the inside and outside. 64.96 in. x 17.72 in. x 11.81 in.